Best Riding Experience In Its Class. 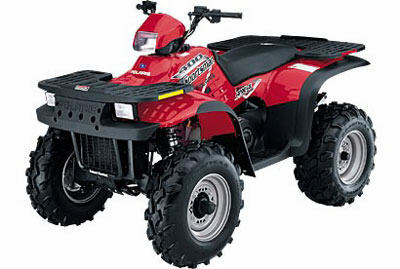 Sportsman 400 Features:• Powerful, liquid-cooled, single-cylinder, 4-valve, 4-stroke, Polaris 400 engine.• NEW Goodyear® Rawhide Grip tires for superior durability and traction.• NEW Sealed, easy-read speedometer with digital gear indicator, odometer, hourmeter, flashing icons, plus diagnostic indicators.• The PVT (Polaris Variable Transmission) is the world’s best-selling automatic transmission—over 1 million sold—and includes a lifetime limited belt warranty. A new spliceless belt design is 5 times stronger for longer belt life.• On-Demand true 4-wheel drive with on/off thumb switch, for superior traction over rough terrain.• Industry-leading 11.25" (14" at highest point) of rock-avoiding ground clearance.• Delivers true 4-wheel drive traction, competitive ATVs deliver only 3 1/2-wheel drive traction.